Born: 7 March 1876 on the St Kitts farm, the oldest of twins. Died: 3rd July 1877 as a result of measles. Aged one year and four months. Hermann Zwar was the only one of ten children of Lena and Peter Zwar to die under the age of 80 years. 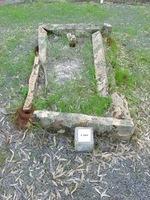 Hermann Zwar was buried in the cemetery of St Peter’s Lutheran Church at St. Kitts.